Week 3 of the NFL Begins tonight!!! Betting is 60% on the road dog with the line moving from Houston 0-115 to NE -1 -108. Models favor NE and public betting favor NE. My models however provide no clues as to value so I am passing on the game. However if your thinking about going with Houston and the 60 % you might want to give it another look. The betting is on the road favorite 56% with the line moving from -10 to -10.5-106. Models and variable are neutral on the game. Public betting is also neutral. Might as well flip a coin on this one. I am passing. Good Luck Tonight which ever way you go. I will be on the sidelines. Wednesday turned into a busy day with 4 one unit plays. Minn was canceled in the 3rd. The 3 other 1 unit plays were Colorado +133 won 11-1, Atlanta +164 won 4-3 and Tampa +107 lost 5-11. Two went our way with the other two staying close to the same. Today I have sent out a 1 unit play in MLB and also we now have two 1 unit plays for College football. In addition I sent out one Big Move Game. Baseball in case you have not noticed is steadily moving along. We are on a 7-2 run the last 5 days! 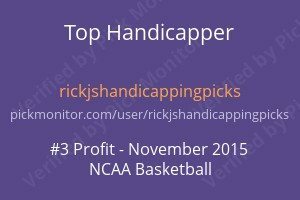 I have sent out two 1 unit plays so far in College football. I am going to try to get these out early when they are clear cut to me. Its not too late to get on board with us for the rest of the football season. 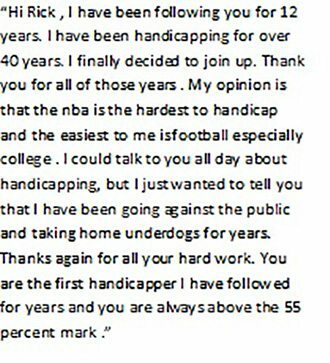 You get along with College and Pro football any other sport I handicap during this time. Take a look at the pay-pal portion of this site and pick the subscription of your choice. All come with a 3 day free trial.